This combination Terra (right)/Aqua (left) Moderate Resolution Imaging Spectroradiometer (MODIS) image from March 2, 2003, shows numerous streams of desert dust coming from land out over the Arabian Sea. 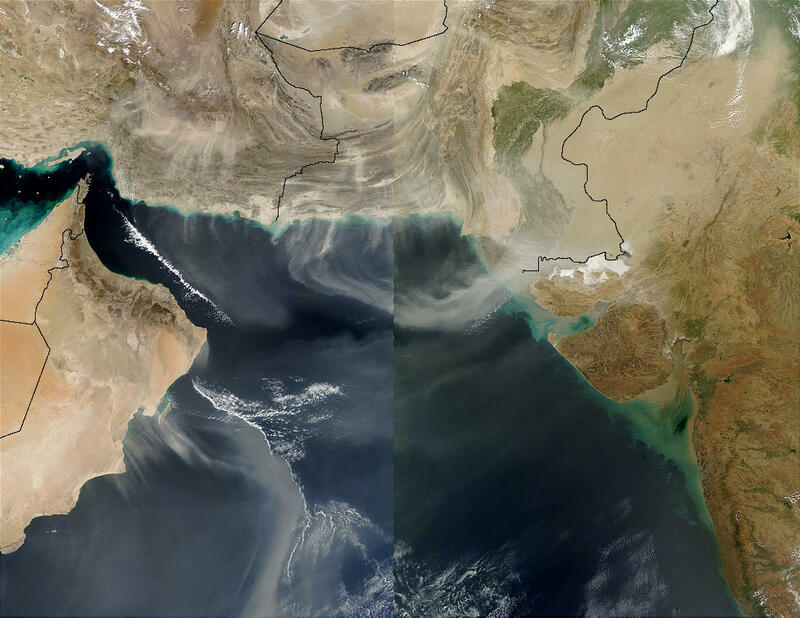 Originating from the Arabian Peninsula (middle left) as well as Iran and Pakistan (top center and top right, respectively) the dust obscures the surface over much of the region. Notice the very thin line of clouds, much whiter and brighter than the dust, running southeastward over the Gulf of Oman and demarcating the edge of the front. Another similar cloud pattern can be seen south of Oman. Notice also the vertical discontinuity running from top to bottom through the center of this scene. The scene appears a bit different to each satellite not only because the clouds and dust plumes are moving, but also because the relative angle of the sun is changing. In the right-hand image (Aqua MODIS), you can discern more dark green structure in the Indian Ocean, indicating the presence of phytoplankton. The intense biological activity going on there is quite likely being enhanced by the influx of iron-rich desert dust settling into the waters there over recent days.